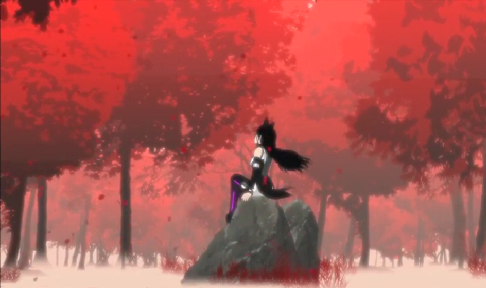 RWBY (Red White Black Yellow) is an 3D animated science fiction action comedy series about a group of students training to be huntress' at Beacon Academy. That's the short version of the story and now for the long version (that sounded cheesy and phoned in). This show starts off with a robbery in progress and the burglars want some diamond looking things. The burglars also try to take hostages but they picked the wrong girl to mess with. 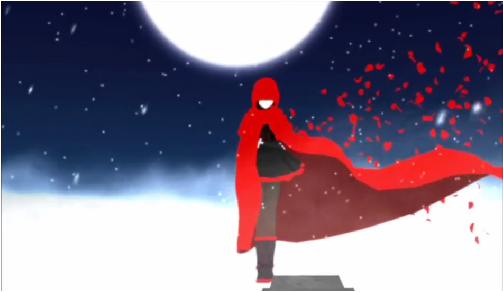 The girl I speak off is a little cutie in red named Ruby Rose and all she wants to do is listen to music. She gets interrupted by the burglars but Ruby doesn't let them steal stuff and pulls out a gigantic scythe and kicks their butts. The leader of the group of burglars runs off but Ruby won't let him get away and so she chases after him. The leader manages to make it to a get away helicopter with a mysterious figure protecting him. The mysterious figure begins to fire at Ruby but from out of nowhere a huntress appears to deflect the attack. The bad guys get away and Ruby gets taken away to custody where the huntress scolds her for messing with bad guys so carelessly. It's not all bad as she is met with Professor Ozpin who finds her skills to be very impressive and ends up making Ruby skip two grades of school so now she is training at a school called Beacon Academy. (Click "Read More" to read the full review). Ruby is a bit shy when she turns up on her first day of school as the only person she knows is her big sister named Yang. Yang advises that Ruby should socialise and make some friends. Ruby instead bumps into a girl named Weiss who is carrying around a substance called "Dust" (those diamond looking things from the first scene) that are used for elemental attacks. 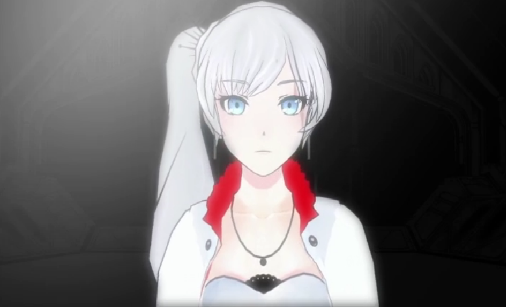 Weiss spills some of the fire element of dust which ends up going into Ruby's nose and makes her sneeze but instead of it being a normal sneeze it ends up triggering the effect of the dust and makes a huge explosion. 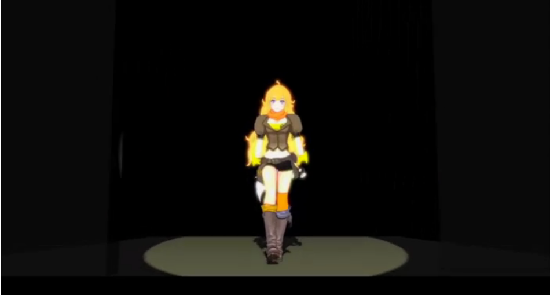 She also runs into a cowardly knight named Jaune and a silent book reading girl clad in black named Blake. After an interesting first day she finds out that her second day is going to be more exciting as her first assignment is to find a temple in a forest and collect an item from it and form a team. Looks like Ruby is going to be in for a hard time at Beacon Academy. The story in this show is far from being original but that doesn't stop it from being interesting, entertaining or good for that matter. It does however give a nice fresh approach to this type of story which will draw you right into the show and you won't be able to turn it off until the whole season is over. I really enjoy the mixture of science-fiction and fantasy as they did it very well to the point where they blend in with each other rather than clashing with each other. Action scenes in this show are really awesome with some very high-octane fast-paced battles that will get you very excited and keep you on the edge of your seats. Characters are really well done with really great personalities that will make you fall in love with them instantly. While I did like them they aren't perfect as there are some moments where they can be a bit annoying but this mainly happens in some of the early episodes where the show is just starting to find it's feet. I also really like how all the character relationships have a very natural feeling where they really do act like as friends naturally do. Animation in this show is a little more lower quality than your standard show and while you will notice you won't be bothered by it. Artwork uses 3D computer generated models and they look pretty decent and I like the cute yet very serious character designs. I wouldn't say that it's the greatest looking show in the world but for what it is it does a good job. It does look better than some of the more recent shows that use 3D models like Ironman Armored Adventures (2009 - 2012) and Appleseed XIII (2011 - 2012). I really enjoyed the English dub on this one as it had a very natural feeling to it where all the lines come out very fluently and had very little lines that sounded forced. The voices did match up with the characters really well and the actors did a good job at giving them some charm and personality. My only complaint is that the dub is a bit rough in the opening few episodes. The soundtrack fits with the show and fits the mood pretty well. Not only is this show action packed but it is also packed with some good special features. 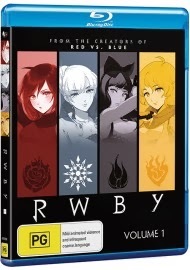 You get two audio commentary tracks with one from the directors and the other one with the cast, a bunch of trailers that act more like mini-pilot episodes rather than traditional trailers, a behind the scenes feature, awesome fan art, a feature on cosplayers dressed up as RWBY characters, and storyboard artwork of episode one. Overall this is a really good watch and I highly recommend that you check this show out. Really looking forward to see how the next season of this show turns out.